We saw Tom Petty and the Heartbreakers Tuesday night. They’re on a 40th anniversary tour, and they still put on a damn good show. The set was all hits, practically a “best of” album collection, and that was okay. The crowd trended older, but you couldn’t tell by the energy they were putting out. This woman in her 50’s sitting just behind us kept screaming “Whoo!… Yeah… Let’s go…” in a raspy voice. She was in the thralls of that sort of ecstatic joy everyone should feel at some point. I think if someone had asked her to die for Tom Petty, she would have. Tom Petty was visibly amused by the degree to which the crowd was worshipping him. He’d raise his arms, the crowd would cheer; he’d lower his arms, the crowd would quiet down, though not completely. He’d laugh and do it again. He played with that Theremin of human voices for a few moments, then mumbled delightedly into the microphone about the “real mojo on this crowd.” A priest raising up vast quantities of energy to feed the unknowable gods of rock n roll. It was a great show, and a truly positive experience that I think everyone in that building needed. The Heartbreakers are still stellar musicians, and they love their fans just as much as they are loved. These are things to heed when one is working to build a own cult following. The crowds were fairly orderly leaving, flowing smoothly towards the main parking garage. Down a sidewalk, around a corner, across a small parking lot, and through a narrow gate that only fit two at a time. Then the stairwell, which is half in shadow under an old oak tree. Hundreds of people, flushed with beer, stoned, happy and sedate. Everyone got to their cars. Everyone tried to leave. We pulled out of our parking spot and into the lane, then sat there for nearly 45 minutes. I had a vision of vampire swarms rising up out the tunnels beneath downtown Austin, slowly feasting their way up the parking garage. I pointed out to my husband that the truck in front of us was the best engine candidate for building a barbecue grill, and that we should remember that if and when the situation devolved into cannibalism. People started getting out of their cars, just a few at first, then in growing numbers, most of them walking towards the teasing shadows of the ground-level stairwell and the unknown dangers of after-midnight on a Tuesday. We did not see any of those people come back. A few others went around the corner and down the ramp, looking for answers. And they did come back, strange knowledge in their eyes. I looked at my husband, and he nodded. We needed to know. I got out of the car. I immediately started to choke on 45 minutes of accumulated car fumes, but I waved at my husband that I was fine and started walking. Past the pickup of people we might have to eat, past the Mercedes and monstrous SUV still battling over the last precious inches that would determine who turned that corner first. Down the ramp, past three different cars where couples were yelling in three different dialects of Spanish. Then the ramp’s side cracked open, allowing me to see down below into the next level. I stood there for a moment, and jumped when a car shifted about ten feet forward. And another car immediately backed out into that space, and the line did not move again. There was no ripple forward. No sirens, no supernatural monsters gorging on trapped prey. Only a demand by natural forces, the forces of unbending mathematical laws, that we sit, and we wait. I turned, coughing again as I made my way back. I spoke to no one on the way back, and no one asked what I had seen. I explained to Reed that we were never getting out of there. Defeated, we put on a podcast interviewing Neil Gaiman about American Gods, and waited. 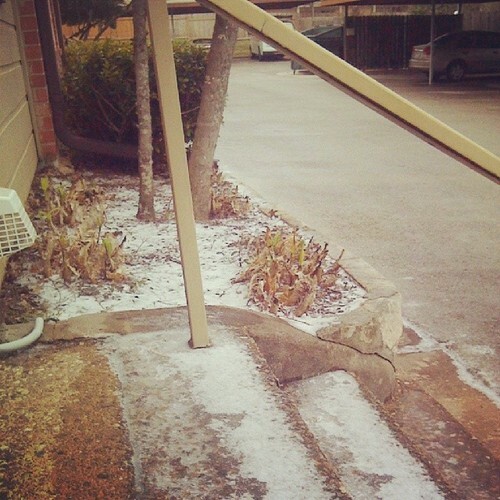 The fraction inch of snow that completely shut down the entire city of Austin, TX, this morning. I’m originally from the Texas Panhandle, where we have to deal with all the nasty stuff that blows down off of the Rockies. I am fascinated by the response down here to some ice on the ground.